Here is an opportunity to go deep into Creation as we begin 2011. See below for the schedule of this transcendent event. FRIDAY, DECEMBER 24, 7:00 PM, Christmas Eve at the Center for Spiritual Living, Asheville, 2 Science of Mind Way Asheville, NC 28806-1444 (828) 253-2325 - Playing keyboard with band for service. 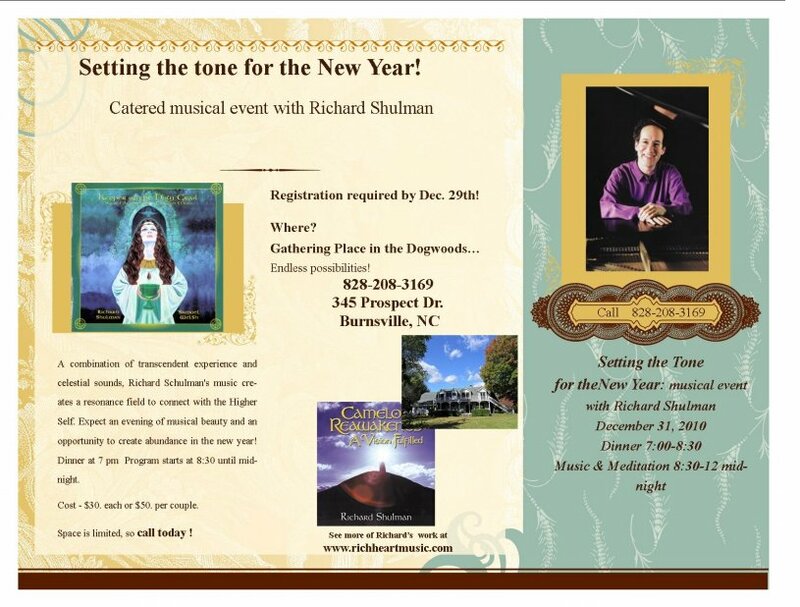 Three deep musical meditations plus dinner to create your new year - Cost - $30 each or $50 per couple - pre-registration required to reserve your meal and space. Call 828-208-3169 for information, directions and reservations. We will end at midnight with a group song. May this time of extraordinary inner light be a blessing in you, through you, and to all you touch.